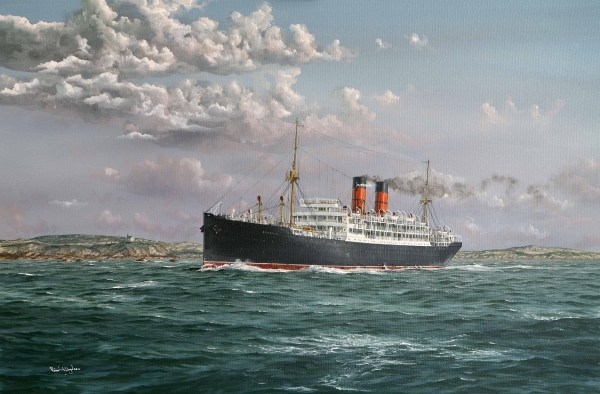 Cunard Line’s first Ascania was originally laid down as Gerona for the Thomson Line, prior to being taken over for completion by Cunard as Ascania. 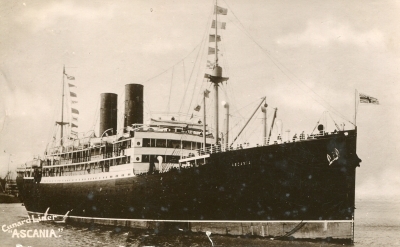 Ascania was used on Cunard's fortnightly service to Quebec and Montreal. During the First World War, the Ascania was used as an AMC sailing across the North Atlantic, but on the eastbound voyages all the third class was occupied by Canadian troops on their way to the battlefront in France. In May 1918 the Ascania also carried a detachment of the US 119th Infantry from Hoboken, New Jersey, first to Halifax, Nova Scotia, and then made up a transatlantic convoy to their destination at the port of Liverpool. They were attacked by submarines on the night of 26 May, but arrived safely at Liverpool on 27 May 1918. The Ascania was wrecked during the night of the 13/14 June 1918 in the Breton Strait, 20 miles east of Cape Ray, Newfoundland. The keel of the vessel was broken so she could not be refloated and was declared a total loss. All hands were saved. The wreck lies with the bow section in shallow water of 3m (10ft) to the north-west and the stern deeper as 15m (49ft) to the south-east on a rocky seabed. Due to the shallow depth and exposure to strong Atlantic swells the wreck has become very broken up and scattered. Both propeller shafts remain complete and in place, running parallel across the top of the wreck. At the stern the propellers have been removed but the steering quadrant and part of the rudder remain. 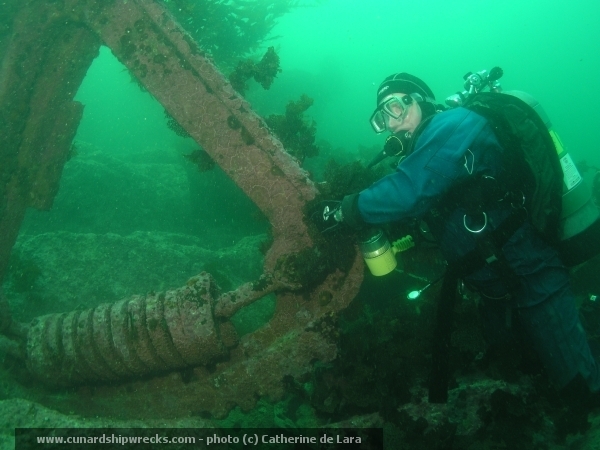 The steering quadrant is an impressive feature of the wreck, standing vertically proud and over 2m (6ft) tall. 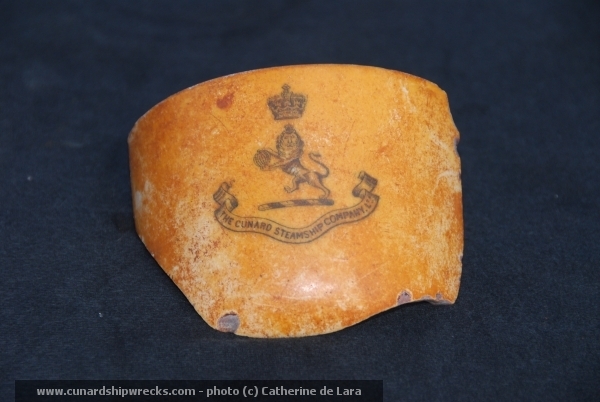 Two spare propeller blades can be found lying on the seabed amongst the wreckage. There is a lot of live ordnance scattered around this area of the wreck. At the side of the wreck parts of the masts can be found and a section of the crow’s nest. Forward of the shafts are two boilers, one of which is standing on end. Beyond the boilers the wreck starts to get a lot shallower and specific features become harder to identify. One anchor remains on the seabed, along with some chain at about 3m (10ft). The other anchor was removed at the time of salvage and remained in Petites for many years. This video was filmed by Rick Stanley of Ocean Quest during the 2006 diving expedition.